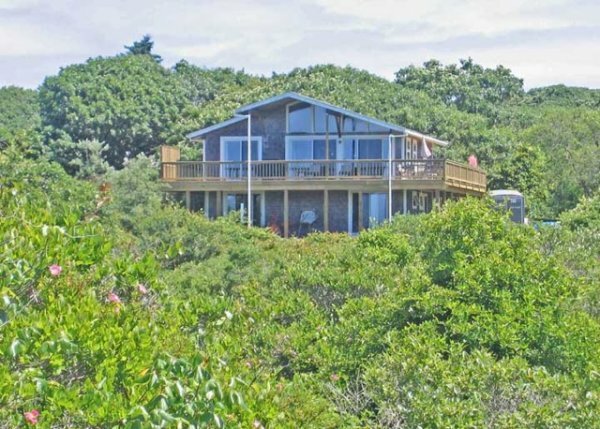 This is a wonderful 5 bedroom home on a hill a quarter mile from Philbin beach witch spectacular views over the Atlantic Ocean. The house is built into the hill and has an open living, dining room and kitchen with cathedral ceilings. Two bedrooms on this level share one full bath. Downstairs is a nice large sitting area with a desk, and 3 more bedrooms, two with twin beds and a third with a double bed. 4 sliding doors allow the breezes through on hot, dry summer days. Plenty of deckspace and a nice lawn complete this fine vacation retreat.